The questions I hear most as a restaurant critic are: How did you become one? How many times a week do you eat out? And how do you not weigh 300 pounds? 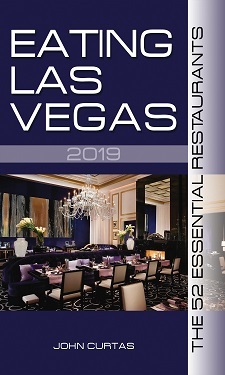 A fourth question almost always follows closely: What’s the best restaurant off the Strip? For the record, the answers are: It’s a long story, 10 times a week, I have the metabolism of a hummingbird—and Aburiya Raku, best known to regulars simply as Raku. The full name means “Charcoal House Enjoyment,” and from the minute Raku opened on Spring Mountain in May 2008, gourmands of all stripes have flocked in to taste chef/owner Mitsuo Endo’s precise renderings of robata-cooked food. For the uninitiated, robata (or robatayaki) cooking is a simple yet sublime form of charcoal grilling, using Japanese oak charcoal to cook vegetables, fish and meat around a small pyre of bright-orange logs. But this charcoal house does not live by grilled foods alone. Endo’s house-made, fried agedashi tofu and foie gras soups have become legendary, and legendary is what his kaiseki dinner is also about to become. 5030 Spring Mountain Road, 367-3511. Kaiseki dinner must be ordered in advance; the cost runs $75-$150 per person and depends on the number of courses and types of sake ordered. A kaiseki dinner is Japanese eating at its most structured, complex and beautiful. Japanese chefs consider it an art form balancing all the senses with the color, appearance and texture of its multiple courses. Everything from the seasonal ingredients to the serving vessels they come in (or on) must complement and build upon your total immersion in the dishes and techniques of the chef. No detail is ignored, nor considered too small to perfect. It is to traditional, barbaric Western eating (giant slabs of protein, huge bowls of starch) what heavy metal is to haiku. To put you in the mood for the delicacies to come, Endo begins this three-hour feast by presenting what looks like a child’s wooden toy. Your server instructs you to push the fresh Takigawa tofu through the box and into a bowl by pressing on the wooden handle, and presto—ribbons of soft, silky curd magically drop into a pristine broth of sweet/savory intensity. Next, a platter is presented containing sweet, marinated smelts (ayu nanbantsuke) alongside a tiny whole crispy crab (meant to be consumed whole), asparagus coated in crispy rice-cracker crumbs and tofu topped with salmon roe. Each bite harmonizes with what has come before and after. From there arrives a dobin mushi clear soup of pike eel, chicken, shrimp and ginko nuts, then sashimi of almost Bar Masa-like freshness, followed by wooden spoons upon which rest two circles of tofu, one seasoned with green-tea sea salt, the other with a grapeseed, balsamic soy glaze. Even as Endo ratchets up the protein—with a foie gras egg custard that will bring tears to your eyes and an ebishinjo (shrimp) soufflé suffused with a hidden, umami depth charge of uni (sea urchin)—he is careful to keep anything from coating your palate with fat, or sticking to your ribs with starch. The better to keep your senses heightened at all times. The seven different sakes poured during the feast also help, rather than hinder, your appreciation of each mind-blowing course. The other animal proteins making an appearance are Kobe beef fillet seared on hot stones and flamed with cognac—an homage to the world’s greatest beef—and gamy, funky, soft-shell turtle meat encased in a grey-green turtle aspic that stands as the single strangest thing I’ve tasted in years. Even if you can’t stand gurgling down some Yertle, this food will work its magic on you. Japanese food can be subtle to the point of invisibility, but Endo’s kaiseki dinner highlights this love of delicacy while bringing forth enough strong flavors to captivate his American eating audience. It is a Japanese food education in 15 courses. I think, finally, I must go to Raku when I come in November. Raku’s foie gras egg custard looks to me like a dressed-up version of the Cardassian taspar egg delicacy. I understand that Chicago is thinking of banning taspar from city menus.